When the Seatweavers Guild posted an image from “laundry basket cars”— a German Korbwagon from the 1920’s, we had to search for more. We found this cool page that documents the various wicker-woven vehicles from the turn of the previous century. I think that if you wove over an old Volkswagon beetle, you’d be guaranteed a place in your town’s 4th of July parade forever. That would be a fun project! 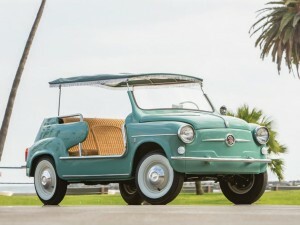 Our favorite is the sweet retro Fiat Jolly. Click on the image below to learn more about Laundry Basket Cars from messynessychic.com. Like us on Facebook and get a Coupon Code for 10% off. Use it anytime! Seat Weaving and Meditation have a lot in common. When you weave a chair seat, before you know it, you may find that you’re “in the zone”. You become relaxed, you forget about your problems and your concentration is focused on the project in front of you. As you weave the reeds over and under, or thread cane through a hexagonal chair caning technique, you may experience a state of deep rest that’s similar to meditation. As with the practice of other crafts like quilting, stitchery and basket weaving, your blood pressure may lower while your breathing becomes more even, your heart rate lowers and muscle tension relaxes too. Like the results of meditation, seat weaving and other crafts may have the added value of decreasing your risk of dementia while increasing your health and well being. It’s no surprise to us that seat weaving and crafts also boost your creativity and enhance your problem-solving skills in the same way that solving a puzzle does. When you’re weaving a seat, you follow the pattern that enables the chair weave to take shape. The weaving requires concentration and that concentration is rewarded by the finish product. The finish product, in turn, makes us feel good through a feeling of accomplishment and well being. Perhaps best of all, when we practice seat weaving with friends in a social setting, it strengthens our relationships. 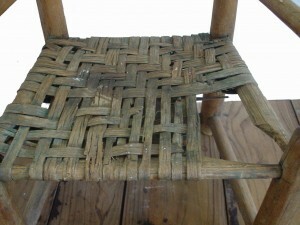 Aren’t these great reasons for seat weaving and chair caning? 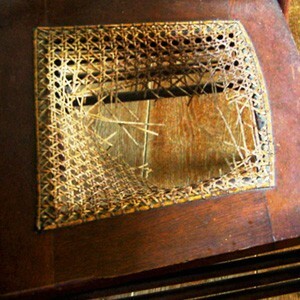 The cost for Chair Caning- that is, “hand caning” chairs that have holes around the perimeter of the frame- seems to be experiencing some regional price raises. I just posted re: the cost of all types of seat weaving a couple months ago. Today I did an online search to see how the costs were holding up USA-wide. I found a wide variation in costs. Not surprisingly, areas that have a lot of antique chairs in their homes also get the highest price per hole for chair caning. $3 per hole. We have had $1.35 per hole as a guideline on our site for years, and some places still charge that price as the norm. However, we’ve decided it’s time that we raise the price to $1.80 so that our seat weaving customers will not sell themselves short. Chair caning takes a long time. The cost for chair caning a chair in blind caning is another level of cost. You can either charge double what you charge for regular hand caning, or add $1 per hole. It is definitely twice the work. Blind caning is caning that’s done on a chair without going through to the other side. This is usually on the back of a fancy chair. The holes are drilled shallow. Each strand of cane must be measured precisely for fit, then glued in place with a plastic peg so that the peg doesn’t set in the glue. Each layer of the weaving requiring thorough drying in between. Blind caning is also called Continental or French caning. You can sell chairs that you’ve picked up at yard sales and restored to their original beauty. You can demonstrate the process of seat weaving or chair caning so that your potential customers appreciate the value of what you have to offer. It’s likely that you’ll meet potential customers who have chairs with broken seats in their attic or garage, just waiting for you to fix them. 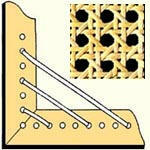 Identifying Chair Caning Supplies has always been a challenge for first time seat weavers. Since beginning our mail order business in 1981, we’ve expanded our catalog many times, finally creating a separate catalog for each of our two divisions: Basket Weaving and Seat Weaving. When the Internet came into wide use by the general public, it gave us an opportunity to finally provide pages and pages of detailed and illustrated information to help customers decide what they needed! Seat weaving customers are different from basket weaving customers in one significant way. A large number of seat weaving customers are buyers due to a need to fix a chair that means something to them personally. They don’t just wake up one day and decide they’re going into chair repair and restoration. Our seat weaving customers often find a chair in the attic, have furniture willed to them, or have decided to finally getting around to fixing the chair that someone put their foot through in 1978. Their dilemma is frequently that they have no idea what the material is. Add to that the fact that if they do know what they have, it’s often known by a regional name that may not coincide with the actual name. “Cane” is a basic term that causes the lot of confusion. Before the Internet, telephone ordering calls were a series of Q&As narrowing down the mystery of what the chair material was. (Shiny? Skinny? Bark-like? Flat? Curved on one side? Twisted? Green? Tan? Brown?) This was always followed by the “Eureka!” moment when both customer and seller agreed on what one could see and the other could not. If that failed, customers sent samples from the old chair that they needed to repair. Battered envelopes frequently arrived containing the few remaining crumbles of dried cane scraps that survived the postage-cancelling machines. Next we set up separate websites for the basket weavers and seat weavers with craft-specific supplies and how-to’s. We think that the most valuable page of www.seatweaving.com is the Choosing Your Supplies page. 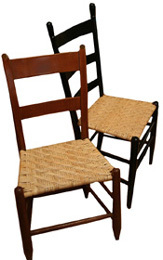 Here you can find images and descriptions for identifying chair caning supplies and other types of chairs. 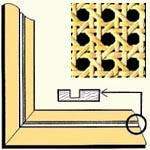 We shows various kinds of chair frames and the types of materials that are suitable for weaving on them. There are visual explanations of the difference between caning with holes and cane webbing with a groove, plus charts to help the customer select the correct size and amount of materials for each project. Like Us on Facebook. Get a Coupon Code you can use right now!